Re-incarnation Vs One Life Theory. Past Life Karma & Astrology. Planetary Positions & Indications towards Past Life. Re-incarnation as a Concept – Simplest of explanation of re-incarnation as a concept is that there are a group of people who believe that present life is one & final and there are other group of people who believe that we come back in different lives & into different forms to see the results of our past life karmas and to finally get liberation, i.e. to merge with the source energy. 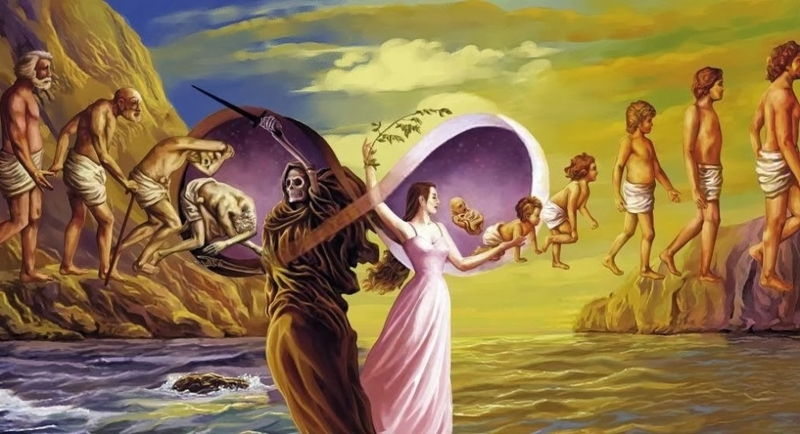 Now, to understand re-incarnation, we need to understand Death in clear perspective as it is standing between two lives. If we understand Death or as Death is projected to us clearly well enough, rest of the re-incarnation can be a walk in the park. Death is most commonly publicized as the End of Life. As long as we continue to have such notions, the re-incarnation theory will face challenges. Death is polar opposite of Birth and because we consider Birth as beginning of life, the Death is bound to be considered as end of life. Birth & Death both are nothing but a point of transformation. With Birth, we only get revealed in this life, in any form (from Rock to Plant to Animal to Human). With Death, we only disappear from current form and reveal into another form. So, Birth & Death are nothing but points of transformations in another form of life. Understand it with this example. There is an electric wire which has current (Life) flowing in it. At its end, we have a Bulb hanging and it is burning bright (Life getting revealed). Suddenly, Bulb got fused (Death). Can we say that current has died or current is no more? No. Current is still there but it is not getting expressed. Similarly, life is always there. It is just when a soul gets association of 5 elements, life gets revealed through a body and when soul leaves it, life gets disappeared and waits for another moment for its revelation. So, Birth & Death are same points of transformation. Hence, it is wrong to say that life has ended with Death. Life never ends. It just transforms itself and reveals differently, which we call re-incarnation. Re-incarnation in Religions – Different Religions have given different philosophies as to re-incarnation. Here, we can have a look at what different religions say about re-incarnation in 2 broad categories. Western Religions – Western Religions like Islam & Christianity seem to have rejected the concept of re-incarnation or at-least this is how these religions are interpreted. For these two religions, current life is one and all. There is no concept of coming back to live another life. Eastern Religions – Eastern Religions like Hinduism, Buddhism, Jainism and Sikhism, have many different opinions within themselves on different concepts of life but in matter of re-incarnation, they all speak the same language. They all accept re-incarnation. Now, I say that all religions, either Western or Eastern, are saying same thing in spirit, though not in letters. When Islam & Christianity projected the concept of one life, the motive would have been that Man will leave everything else and will dedicate himself to knowing the source energy. Thus, he will be able to move towards liberation in one life only. So, it will eventually become a one-life scenario that he came and liberated in one-go. Similarly, when Eastern Religions projected the concept of many lives, one after the other, they never meant to tell us that you have luxury of so many lives to get liberated. They also meant that work towards liberation in this life only else you have to come back again and again to live the same life in different forms. Hence, it was not a luxury given in eastern philosophy but a kind of warning. So, both sides are emphasizing on same thing that know God/Source in this life only and make it a last one by liberation or merging with him. But as always Humans want to understand things as per their desires and hence Westerners took it as licence to enjoy their only life and Easterners said where is the hurry when we have so many lives? Re-incarnation Vs One Life Theory – We can go on with arguments in favour/opposition of Re-incarnation Vs One Life Theory but where I find balance shifting in favour of re-incarnation is that if there is only one life and we are destined to have only one go at life, then at least the starting point should be same for all. A Justifiable God will give a justifiable chance to everyone at life if he is only allowing one chance. But this doesn’t seem to be the case. Someone is born rich and someone is born poor. Someone is born healthy and other may be handicapped. Someone is born in the most prosperous countries & time and yet there are many who are born in famine affected areas. Now, either God is irrational or there is some reason behind giving unequal treatment. As I see, God can’t be irrational and only reason possible is your past life karma. Hence, concept of re-incarnation has a little upper-hand against the one-life concept as it is popularly practiced and projected. But as I said above, in spirit they are same. Rahu – Rahu is the main reason behind this life. It is our last desire of past life which remained unaccomplished. For the accomplishment of same desire, soul seeks a body again. Hence, when person re-incarnates, he always gravitates towards Rahu. Rahu’s position is immensely important in our chart. House, Sign, Nakshatra, Lords etc, everything must be seen. Rahu in 10th house means person wanted to be famous in past-life but could not be. Rahu in 7th house means person wanted to have a great relationship life but could not get it. At the same time, as much as Rahu gravitates us towards the house it is sitting, we also feel scared of that house, for the simple reason that we have no experience at doing those things. We haven’t done those things in past life. So, it is an unknown territory. But it is that territory which we have to accomplish in this life else we are coming back again to accomplish it. Rahu getting conjunct with any planet also shows that you have left over karma related with that planet or the houses it rules. Ketu – Ketu is exactly opposite to Rahu. Ketu represents things which we have done in past life. It doesn’t mean that we have done well enough but we have at least had experience over those things. Ketu is territory which is walked over. Hence, we rely and fall back on Ketu every time we are in trouble because we trust it as we have experience over those things. Like, Ketu in 4th house person will always seek help of Mother or Home whenever he gets into trouble but the lesson for him is to leave the support of 4th house and walk towards 10th house as Rahu is there in 10th house. He has already done with 4th house things. Need to shift focus towards 10th house things. That’s why, relationships become so troubled with Ketu in 7th house. Person falls back on 7th house but doesn’t get worthy partner or family and he has to come back towards self/1st house. It continues till he realizes that his primary duty in this life is towards himself. Again, planets conjunct with Ketu also shows the karmic issue with things related with planet. Also, any planet in Rahu/Ketu nakshatras also show the karmic debt from past life. Saturn – Saturn represents those things from our past-life which we got easily in last life but didn’t value them. Hence, those things will be delayed in this life to make us realize their value. That’s why, when Saturn gets involved with relationship related houses or planets, relationships are delayed or I should say that it should be delayed. Early marriage in such cases may get sore with time. It shows person had good spouse in past-life but didn’t value him/her. So, person needs to wait now in this life to get a good spouse. Saturn impacting Career may show a hard time in finding the right career path. It shows that person misused his authority in past-life, hence authority is delayed in this life. Like this, Saturn shows what we didn’t value or what we misused in past-life which made us wait in this life. Mars – Retrograde Mars shows that person didn’t use his actions/aggression in a dignified way in past-life, hence Mars is retrograde now and he will have to work out his aggression in a dignified way. It also makes a person lazy. So, person needs to sort that out too. For a girl, it would also show that she didn’t treat her lover in a good way, so Mars (Boyfriend) may not be worthy now. This is also what Mars generally does when it is not well placed in chart like in enemy sign or debilitation. Person needs to workout his aggression and action as he misused those. Mercury – Mercury retrograde shows some past-life karma with Sibling. It also shows person misused his communications and now in this life, he has to work hard to get his communications right and beneficial for all. Jupiter – Jupiter retrograde shows past-life issues with Teachers & Teachings. For a girl, it also includes Husband. Jupiter retro means you got a good Guru in past-life but you didn’t value him or his teachings, so now it is hard time finding the real knowledge. It also shows person thinks a lot about his right belief system. He tries different religions to understand which one is right? He tries different Guru & Philosophies and that’s how he will exhaust his past life karma. Venus – Venus retrograde shows some serious issues with love matters and relationships since past-life, which person needs to sort out now. Basically, it is same thing. You didn’t treat your love interest well enough in past-life and now it is time to payback. It also shows karmic debt towards wealth/luxury or lack of it. Saturn – Saturn retrograde is the most unique one. Saturn is time. Retrograde means going back. So, Saturn retrograde actually means that person is living his whole time/life again. Saturn represents duty in life. Somehow, he neglected his duty in past-life and now he is called upon to perform the same duty again. Dedicated to all those people who think that Suicide is a way to escape their karma. 5th house and 5th house lord – 5th house is known as Purva-Punya Bhava. It means house of past life deeds. Now, it can be good deed or bad deed of past life. If malefic planet is 5th house lord or impacting 5th house then bad deed. If benefic planet is 5th house lord or impacting 5th house then good deed. So, 5th house and 5th house lord conditions speak a lot about what kind of deeds you have done in past life which you will reap/payback in this life. Moon – Moon represents Mind and it is said that memories of all our past lives are stored in mind. Hence, Moon position also speaks a lot about our past life karma. Moon debilitated or with malefic planets show karmic debt towards Mother and the things which Moon rules in your chart. “After the end of Mahabharat war, Lord Krishna and Pandav brothers went to meet Pitamaha Bheeshna, who was still lying on bed of arrows and waiting for the last meeting with Pandavs. After their meeting, Bheeshma asked Krishna - I remember my last 100 lives and I remember that I didn't commit any sin in those lives, then why I am suffering pain like this? Lord Krishna replied - It is because in your 101st life before this birth, you were a prince and one day while going in your chariot, you saw a crab moving right in front of your way. You came down from chariot, lifted that crab with an arrow and thrown in a nearby bush. That crab landed on its back on a bush which had spines on it and felt unbearable pain. From there, it cursed you to feel the same pain. Through out last 101 lives, your good deeds were so good that curse of that crab could never effect you, but when in this life, you remained silent during disrobing of Draupadi, the good effect of your good deeds nullified and Crab's curse started showing its impact. 1. Whatever wrong is happening in our life, is nothing but our own karmic debt. Hope this helps. Please feel free to comment, if any. Does the mahabharat story mean those who remain silent in the face of grave injustice are also responsible for it and hence their prior good deeds are rendered null thereafter? They also get the bad karma along with the actual perpetrator? Good information but more example & anylyses needed the article. namaste, rahu if placed in fifth house and mars is lord of fifth house located in 12th house along wih saturn.Doee this signify bad karmas of purvajanma.I want to ask whether having desire for awakening even if god forbid i am not able to achieve do we carry this in next birth.